Deborah H. Atkin, M.D. announces recently FDA-approved UltraShape® can provide targeted body contouring with no downtime or discomfort for men and women. 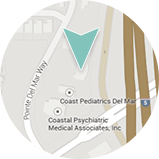 Del Mar, CA—Designed to reduce pockets of fatty tissue in areas of the body resistant to diet and exercise, UltraShape® offers patients an exceptional method of body contouring without the drawbacks traditionally associated with surgical procedures. Painless, safe, and effective, Deborah H. Atkin, M.D. says this state-of-the-art technology can also provide permanent results if patients maintain their weight. UltraShape®, which has been utilized in Europe for years, has been recently FDA-approved for use in the U.S.
UltraShape® offers an innovative take on non-invasive fat removal, Dr. Atkin explains. 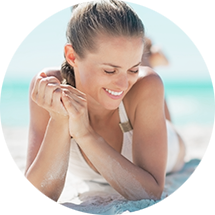 While some technology uses thermal energy or freezing temperatures, such as CoolSculpting™, UltraShape® delivers gentle ultrasound waves into the targeted area, breaking up fat cells while leaving surrounding skin, muscle, and other tissue unharmed. As a result, she says patients can reduce stubborn pockets of fat fast and painlessly in approximately three treatment sessions, which will be spaced one week apart. She further notes that individuals can typically return to normal activities immediately following the procedure, and the only side effect usually will be some mild swelling. 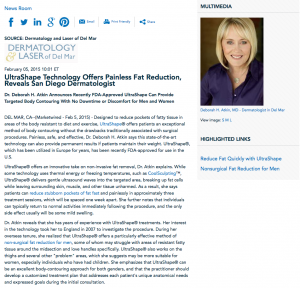 Dr. Atkin reveals that she has years of experience with UltraShape® treatments. Her interest in the technology took her to England in 2007 to investigate the procedure. During her overseas tenure, she realized that UltraShape® offers a particularly effective method of non-surgical fat reduction for men, some of whom may struggle with areas of resistant fatty tissue around the midsection and love handles specifically. UltraShape® also works on the thighs and several other “problem” areas, which she suggests may be more suitable for women, especially individuals who have had children. She emphasizes that UltraShape® can be an excellent body-contouring approach for both genders, and that the practitioner should develop a customized treatment plan that addresses each patient’s unique anatomical needs and expressed goals during the initial consultation. Ultimately, Dr. Atkin believes that UltraShape® is a revolutionary device that can allow patients who are dissatisfied with their appearance due to the accumulation of excess fat to lose weight in targeted areas, achieve their cosmetic goals, and, potentially, to restore their sense of self-esteem. Furthermore, she reiterates, the process typically is comfortable, safe, and effective, so individuals can lose fat without suffering. A graduate of the University of California, Los Angeles, Dr. Atkin is a board-certified dermatologist based in Del Mar. After graduation, she continued her medical training with an internship at Scripps Clinic and Research Foundation in San Diego, followed by specialty dermatology training at the University of Arizona, Tucson. An ardent philanthropist, Dr. Atkin received an award from the UCLA School of Medicine for Outstanding Community Service, and she volunteered her medical services to the American Cancer Society and the African Medical Mission. She is also a member of several esteemed medical associations, including the American Academy of Dermatology and the American Society of Dermatologic Surgery. She is available for interview upon request.